Discount Magic - 1.5" Pink Super Soft. Albert Goshman the creative mind behind the Super Soft Sponge Ball! Sponge Balls are a staple of close-up and table magic, with the magic often happening in the spectators hand. One of the only items in magic where they are purely a magical prop they have been accepted, and loved by spectators over time. The Goshman sponge products are at the top of the tree in regards quality, and design. These Super Soft Sponges will easily pack small, and regain their shape in a blink. Beautiful to handle, and great magic. 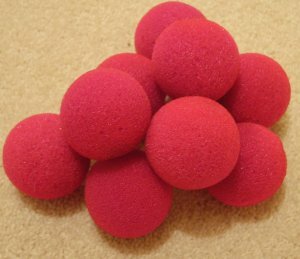 These are 1.5" super soft pink sponge balls. 1.5" Pink Super Soft Albert Goshman the creative mind behind the Super Soft Sponge Ball!